The Canon EF 70-200mm f/2.8L IS II USM Lens delivers impressive image quality, focuses accurately very fast and has top-of-the-line build quality, 4-stop Image Stabilization, weather sealing and a very useful focal length range. This is now my favorite and one of my most-used lenses. Actually, I have many favorite lenses, but overall, the 70-200 f/2.8 II is now my most-favorite - a status the predecessor to this lens, the Canon EF 70-200mm f/2.8L IS USM Lens (version 1) held prior to this review. I was happy with the original 70-200 f/2.8L IS, but a new version of a lens usually brings improvements of significance - otherwise, it would not be developed in the first place. One of the first hints of the version II's improvements came from Canon's theoretical MTF charts. The higher the lines in a Canon MTF chart, the better the lens can be expected to perform optically. The Canon MTF chart comparison below shows an expected noticeable wide open aperture image quality improvement in the new lens. The MSRP was another high quality indicator. The Canon EF 70-200mm f/2.8L IS II USM Lens' real world image quality and image quality improvement over the original version are impressive - much better than I expected. The 70-200 f/2.8 IS II is very sharp wide open from the center of the image circle right into full frame corners at all focal lengths. Of the three copies I evaluated, the second traded some 200mm image quality for slightly improved 70mm image quality. The with-extender tests at 280mm and 400mm confirm this of course. Feedback from others is that the "sample 2" lens is indeed an outlier - but still very good. Contrast is especially impressive from all three lenses - a noticeable improvement over the version 1 lens. Stopping down increases sharpness only very slightly. More noticeable from stopping down is the clearing of a small amount of vignetting in the corners. A small amount of vignetting is visible in full frame corners with a wide open aperture and is most noticeable at 200mm (just over 1.5 stops). At f/4, vignetting is essentially un-noticeable except at 200mm where another stop of aperture reduction continues to reduce the light fall off. The 70-200 II's vignetting results show a slight improvement in the wide and mid-focal length range compared to the 70-200 I, but the strongest vignetting focal length, 200mm, shows similar corner darkening. The 70-200 II's 200mm vignetting results are similar to or better than the other available-at-review-time 70-200mm lenses including the Sigma 70-200mm f/2.8 EX DG HSM II Macro Lens and Tamron 70-200mm f/2.8 Di Macro Lens. CA (Chromatic Aberration) is practically non-existent in the 70-200 f/2.8L IS II - which is a small improvement over the version one lens that shows a small amount of CA in full frame 200mm corners. This lens shows distortion characteristics very similar to the original 70-200 f/2.8 IS lens. Relatively minor barrel distortion at 70mm is neutralized by around 90-95mm. The transition to relatively minor pincushion distortion continues through 200mm. With a rounded 8-blade aperture, the 70-200 f/2.8L IS II delivers bokeh (foreground/background blur quality) very similar to the original 70-200 f/2.8 IS, which was very good in this respect. With an f/2.8 maximum aperture over the entire telephoto focal length range, this lens is able to create a strongly blurred background - and provides a bright viewfinder. The 70-200 f/2.8L IS II is not flare-free, but the big story is the improvement over the original 70-200 f/2.8 IS in this category. Flare is easier to show than describe, so let's look at a comparison. 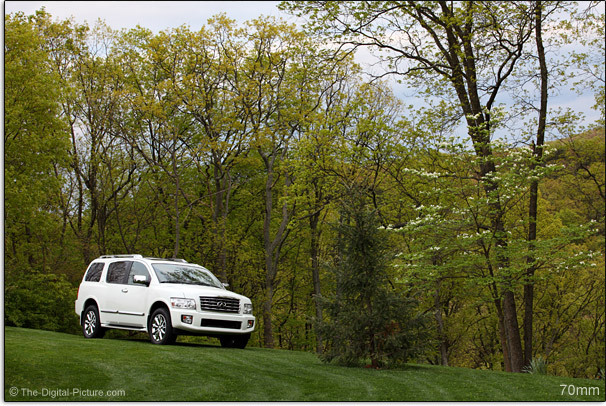 These images were shot with an EOS 5D Mark II in Av mode. The sky was clear and the perfect flare source, the sun, is in the corner of each frame. Note that, to reduce page load time (especially for mobile users), this comparison is being hosted on a separate page. Click on the image below to open this comparison in a new window/tab. Use Alt-Tab/Ctrl-Tab to toggle back and forth. 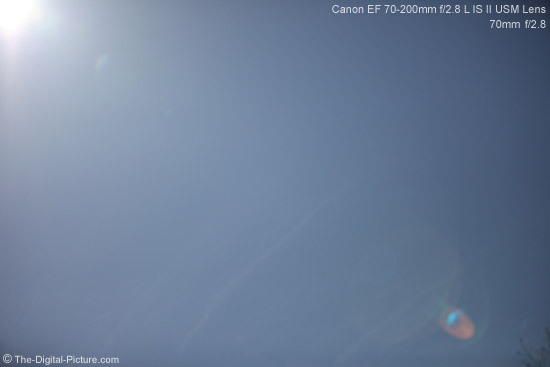 Susceptibility to flare was a weakness of the Canon EF 70-200mm f/2.8L IS USM Lens. The 70-200 f/2.8L IS II gives us a nice flare performance improvement - It will deliver better image quality in a back-lit environment. I kinda like the original 70mm narrow aperture flare art effects though. While reviewing lens comparisons ... you can view an image quality comparison between the three new Canon EF 70-200mm f/2.8L IS II USM Lenses I tested and the first version 70-200 f/2.8 IS lenses using the ISO 12233 Chart Comparison Tool. Especially note the darkness of the black details when comparing the two 70-200 L IS lens versions. 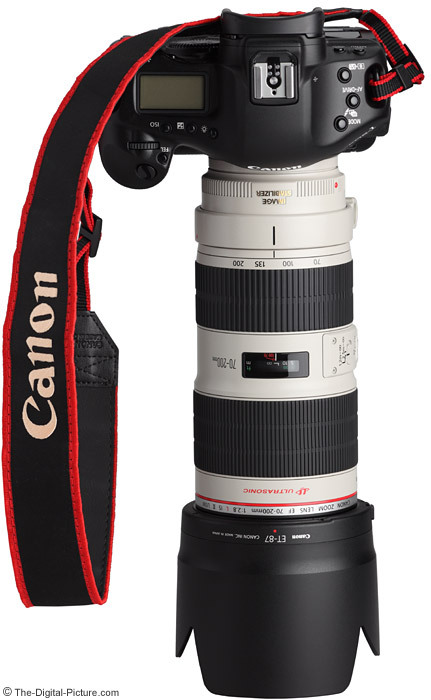 Several other 70-200mm lenses (including the also-impressive Canon EF 70-200mm f/4.0L IS USM Lens) and all other Canon lenses are available for comparison using this tool. Up for comparison next is a distant outdoor scene. Shooting an accurate studio image quality comparison is not easy, but doing this outside is even harder. The wind must be calm and/or the target must be immoveable (to prevent subject motion blur). A clear sky and a high sun are required so that scene lighting remains as close to even as possible (including light color) during the shoot. Unfortunately, a high sun and a distant target mean heat waves will add distortion to the image. Still, using discernment, the results can show image quality differences. The AWB (Auto White Balance), Standard Picture Style, sharpness = 1 (very low), equalized exposures below were shot tripod-mounted using the lens tripod ring - which I obviously did not get identically rotationally-aligned between lenses. 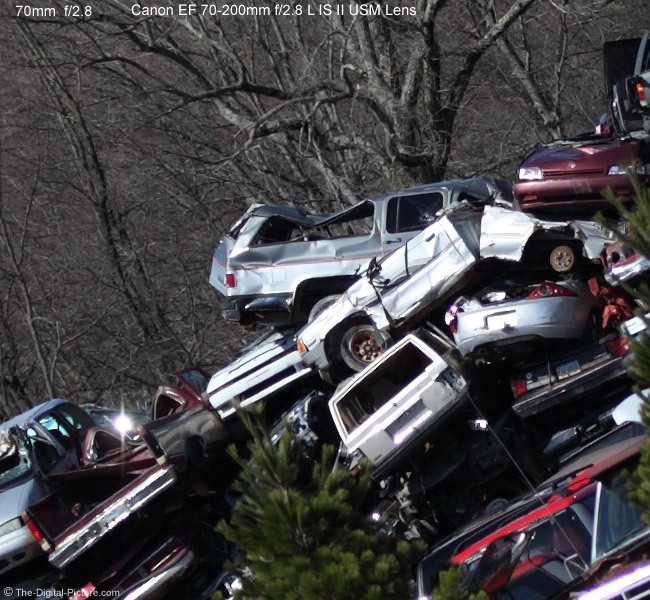 We have the US Government's Cash for Clunkers program to thank for today's local recycling center comparison subjects. I usually show mid-to-corner of the frame image quality comparisons in reviews as this is where the biggest difference between lenses is usually seen. In this case, I'm showing a just-above-and-left-of-center crop as the difference in contrast between the old and new 70-200 f/2.8 IS lenses is very noticeable in the center of the frame - and sharpness differences are actually less noticeable in the corners. Use the links below the test image to select the image to be shown. Ignore differences causes by atmospheric distortion/warping. Again, this comparison is being hosted on a separate page to improve page load time – just click on the image below. Again, I'm impressed with the improved contrast of the version II lens. I know - 135mm results are missing. Even though I shot that focal length multiple times, I was not confident that the version I lens was perfectly focused at 135mm, so they are excluded. The 135mm results mirror the 100mm results. I have shot several indoor, low light events with the 70-200 f/2.8 II IS using the f/2.8 aperture exclusively and consider the wide open results remarkable. I'm impressed. I love image stabilization. It clearly helps in obtaining a sharp image with a handheld camera. The link on the left (below picture) shows your image with IS turned on. The link on the right shows your image with IS turned off. 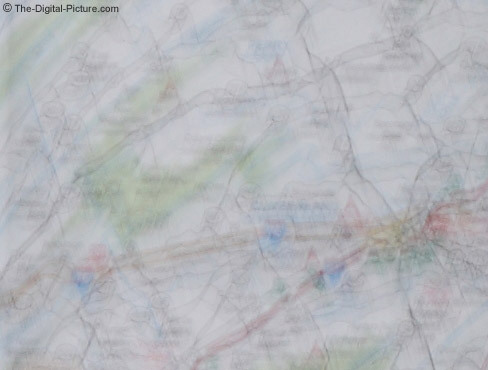 While the IS-Off image may have a little artistic value in someone's eyes, the IS On image is what I am usually looking for. 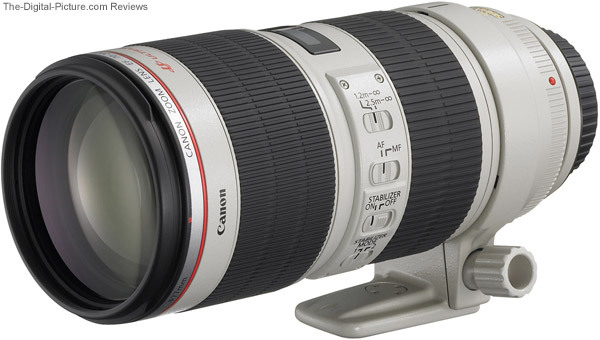 Canon rates the Canon EF 70-200mm f/2.8L IS II USM Lens' IS system for 4-stops of assistance. Testing showed that I need a shutter speed of 1/80 to get a high percentage of sharp 70mm images with this lens. Turn on IS and my shutter speed requirement drops to about 1/4 second which is slightly better than 4 stops of help. At 200mm, my shutter speed requirements are 1/160-1/200 without IS and 1/15-1/20 with IS which is between 3 and 4 stops of help. There is not a hard floor to the acceptable handheld-with-IS shutter speed used - but there is a diminishing return in the results as the shutter speed lengthens. The example shots above were taken handheld/standing at 200mm with a 1/8 second shutter speed. The keeper rate is below what I'm comfortable with at these settings, but if you take enough shots, you will likely get what you want. I have good 200mm results at even 1/6 second but need to shoot about 10 shots for every good one. Note: Few awake people can remain motionless enough for a sharp photo at these shutter speeds. Just in case you were thinking that. The original 70-200 f/2.8 lens' IS was rated for 3 stops of assistance but the difference between IS on these lenses does not stop with this number. The version II lens' more modern IS system is better behaved - more stabile with less viewfinder jumping at startup. It is also quieter - almost silent aside from a little audible start/stop sound. IS is not a miracle for every situation - but I find it extremely useful. Aside from IS's obvious ability to allow handheld shooting in low light situations, providing a still viewfinder makes critical framing easier. IS also provides a steadier image to the AF and AE systems - allowing them to function more accurately. The primary situation where IS is not helpful is when your subject is moving. Mode II (Panning Mode) IS is available for controlling camera motion blur in one direction (great for tracking a vehicle or bike), but a moving subject needs a faster shutter speed to stop the subject motion blur. 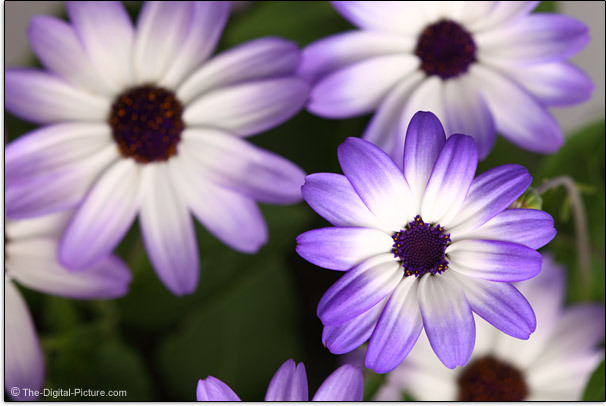 Getting a faster shutter speed means using a wider aperture or increasing the ISO setting. Using flash as a main light is also an option. I seldom use IS when shooting sports and other action and always turn IS off when using a tripod (unless using a super telephoto lens). Although IS is not really needed anytime a very fast shutter speed (an easily handholdable speed) is being used, I seldom turn IS off for other purposes. Unlike with precision image quality testing, event and most other typical uses for this lens rely on autofocus. 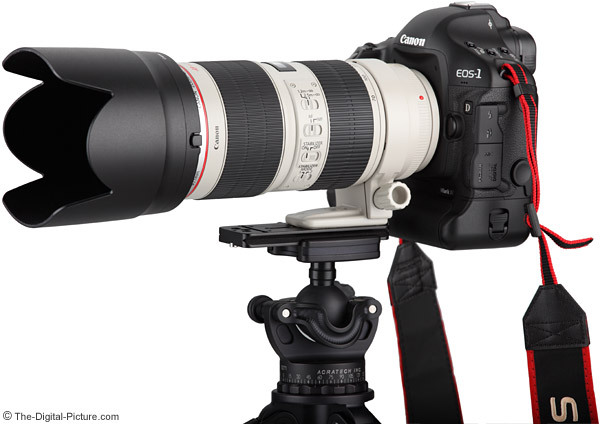 The Canon EF 70-200mm f/2.8L IS II USM Lens is equipped with a very fast, quiet Ring USM (Ultrasonic Motor) AF system. The II's AF is consistently very accurate. AI Servo AF performance is very good even with challenging subjects incuding galloping horses. A zoom telephoto lens is great for tracking approaching action while maintaining proper framing. 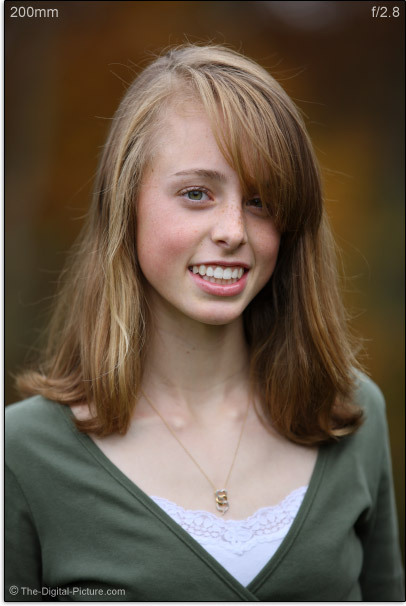 This example was shot at 123mm and f/2.8 using a Canon EOS-1Ds Mark III. The sharp plane of focus is on the rider as I intended. The original 70-200 f/2.8 IS has a similar AF setup, but, putting the two lenses side by side shows that the 70-200 f/2.8 IS II lens clearly focuses faster (and is slightly quieter). The 70-200 f/2.8 IS II's autofocus system and performance are as good as it gets. This is an internal/rear-focusing lens - it does not change length during focusing. FTM (Full Time Manual) focusing is enabled. The common-sized 77mm filter threads do not rotate (makes using a Circular Polarizer Filter easier). A focus limiter switch is provided - optional ranges are 3.94' - ∞ (1.2m - ∞) and 8.2' - ∞ (2.5m - ∞). Restricting the focus distance range can improve focus performance - primarily by reducing the available focus hunting range. The user manual indicates that this lens is not parfocal - meaning it does not hold focus when zoomed from one focal length to another. Testing shows this to be true. The Canon EF 70-200mm f/2.8L IS II USM Lens shares a MFD (Minimum Focus Distance) with the two current-at-review-time 70-200mm f/4L lenses. The 8.1" (200mm) reduction in MFD from the original 70-200mm f/2.8 IS Lens is very nice - I'm really liking the difference when shooting tight portraits with a full frame DSLR. A .21x MM (Maximum Magnification) at 200mm is not going to get this lens confused with a true macro lens, but this value is good enough for nice flower shots and tight portraits. If shorter focusing distances are needed, extension tubes can help - taking the maximum magnification ranges to 0.28-0.06x and 0.36-0.14x for 12mm and 25mm tubes respectively. A Canon 500D Close-up Lens will yield 0.14-0.60x MM values. The Canon 250D Close-up Lens, at review time, is not available in a 77mm size. This information is available for research and comparison in the Lens Specification and Measurements Tool. Need more magnification from the same focus distance? The 70-200 f/2.8L IS II is compatible with the Canon Extender EF 1.4x III and Canon Extender EF 2x III as shown above. I generally recommend buying a lens with the focal lengths you need natively in them - they usually provide better image quality and focus speed. Such lenses included the Canon 100-400mm f/4.5-5.6L IS USM Lens, Canon 300mm f/4.0L IS USM Lens and the Canon EF 400mm f/5.6L USM Lens. But, two of the three Canon EF 70-200mm f/2.8L IS II USM Lenses I tested perform especially well with extenders (again, I strongly suspect the other lens to be an outlier). See the results first hand in the ISO 12233 chart tool (here is a comparison). Images are sharp wide open at 280mm (f/4). The 1.4x reverses the 200mm pincushion distortion (resulting in very low distortion) and adds some CA and slight full frame corner softness. The 2x causes a noticeably softer image at 400mm. The in-focus flower above measures slightly over 2" (50mm) in diameter. It was shot at MFD using a Canon EOS 5D Mark II (a full frame sensor body) at 280mm (using a 1.4x extender). APS-C/1.6x body users can expect even tighter framing at 200mm. I am finding that the Canon EF 70-200mm f/2.8L IS II USM Lens autofocuses fast enough for sports with either extender attached (on a Canon EOS-1D Mark IV body at least). I am especially pleased with the results from the 98-280mm f/4 IS-equivalent lens the the 1.4x extender creates. When you get the 70-200 f/2.8L IS II box, the first impression is - wow, this is a big box. The box has grown immense relative to the previous version. Fortunately, only the packing has grown significantly. The lens arrives very well packed in foam and other padding - including the very nice Canon LZ1326 Lens Case. The lens itself has grown, but not nearly as much. The above table compares many 70-200mm telephoto zoom lenses. Many more comparisons with much more detail can be made in the Lens Specifications and Measurements Tool. Here is a Canon EF 70-200mm f/2.8L IS version I vs. version II USM Lens comparison. What you will notice is that the version II lens is slightly larger (actual measurements indicate .1" / 2.4mm in both dimensions) and is slightly heavier. Sitting the two lenses beside each other on the counter, I thought the version II lens had to have grown more than the numbers indicate. Here is a product image comparison. The focus ring received the diameter growth, but it is also .35" (9mm) larger in length as well (a positive change). The mid-portion of the lens barrel also expanded in diameter (and the switches were recessed) to give a more-smooth overall design. The combination of these changes give the appearance that the lens has grown more than it really has. When focused on subject action, I don't notice the change in size or weight - partly because the zoom ring (which remains unchanged) is where my left hand stays most of the time. The 70-200 f/2.8L IS II is still a moderately heavy and somewhat large lens that still handles very well. When you see the red ring around the end of a Canon lens, you know it is part of the Canon L Series Lens family. And your expectations of the lens go up. Great build quality is one of those expectations - and the Canon EF 70-200mm f/2.8L IS II USM Lens again does not let us down. The metal lens barrel feels very solid - and stood up to the power driver's seat test. I put a 5D Mark II and mounted 70-200 f/2.8 IS II in a Lowepro Toploader Pro 75 AW on the back floor of my car (expensive gear always rides on the floor to prevent going their accidentally) and adjusted the driver's seat to the position I needed (way back). When I got to the venue, I found the camera and lens crushed between the front and back seats at the worse possible angle (and I gasped of course). I could not budge the case even slightly. I moved the seat forward and all was fine. That's just one example of how good build quality can save the day - I'm very careful, but I still have many stories - things happen. Weather sealing is another 70-200 f/2.8L IS II build feature that can save the day. The focus & zoom rings provide firm resistance but are very smooth with no play (definitely improved over the previous version). The fixed size of this lens is a great feature and I love the smooth design and flush switches. 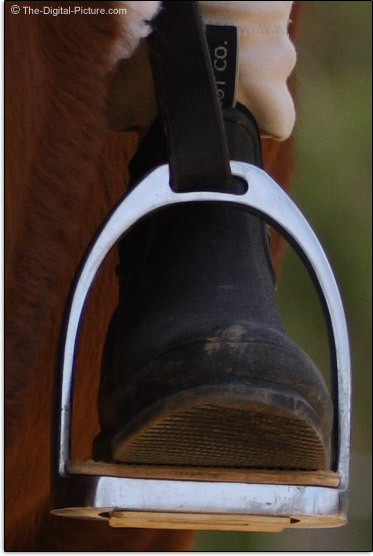 The included, removable tripod ring (collar) works smoothly. Tripod rings allow the lens to be tripod or monopod-attached at the approximate balance point for the lens and mounted camera. The camera can then be rotated freely in the ring or locked tight. I have a Wimberley P30 Lens Plate (the P20 also works great) attached to my 70-200 II. This allows quick attachment to any Arca Swiss-compatible clamp such as I have on my Monopod, ball head and flash bracket. The lens plate can also function as a focusing rail. 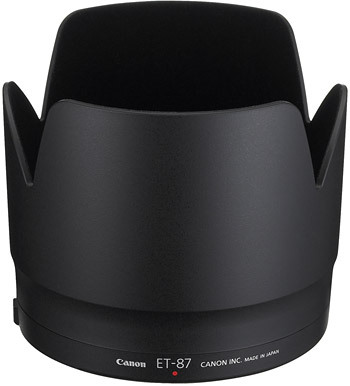 The included Canon ET-87 Lens Hood has a nice textured finish that is more resistant to marking and reflections than the older smooth style. It also has a small push-release lock button. The ET-87 smoothly bayonet mounts and crisply locks into place. This is helpful as a petal-style hood not rotated fully into position can shade a portion of the lens image circle. The attractive hood puts the finishing touches on a lens that is sure to impress your clients (and friends) - impressive both from an appearance and an image quality perspective. Notice the absolute black lens hood interior? Canon adds flocking to the inside of their lens hoods. Even though a studio monolight was aimed directly into the lens hood (you can tell by reflections on the end of the hood itself), the flocking did not reflect any light back to the camera position. Keeping stray light out of the lens is the lens hood's job - as is protecting the front lens element. Canon knows how to make a great 70-200mm lens. When someone is looking for a second lens, one of the Canon EF 70-200mm L Lenses is my most frequently recommendation. And there is one that is just right for everyone. Shown above and below, from left to right are the Canon EF 70-300mm f/4-5.6 IS USM Lens, Canon EF 70-200mm f/4.0L USM Lens, Canon EF 70-200mm f/4.0L IS USM Lens, Canon EF 70-200mm f/2.8L USM Lens, Canon EF 70-200mm f/2.8L IS USM Lens (discontinued) and Canon EF 70-200mm f/2.8L IS II USM Lens. A big reason the 70-200 L lenses make a great second lens is the focal length range they cover. Most people have the medium wide angle to short telephoto focal length range covered in their general purpose lens and are looking for a lens that will bring their subjects in closer. Click on the image below for a focal length and aperture comparison created using the Canon EF 70-200mm f/2.8L IS II USM Lens and a 1Ds Mark III DSLR (full frame). You will learn how the focal length range and aperture work together along with seeing the background blur each combo creates. Drag your mouse vertically over the mouseover labels to see a focal length comparison (all images were captured from the same tripod position). Drag your mouse horizontally over the mouseover labels to see an aperture comparison within a focal length. Take special note of the f/2.8 background blur advantage this lens has compared to other available lenses with narrower max apertures (f/4 and f/5.6 especially). Here is another full frame focal length comparison at f/8. The other reason for choosing a 70-200mm L Lens is simply the overall quality of these lenses. They all are built very well, quietly focus fast and have great image quality. The Canon EF 70-300mm f/4-5.6 IS USM Lens is a popular lens and has IS and a lower price, but it is not up to the level of the L lenses in these other regards. The 70-200 f/4 models are relatively small (especially narrow) and light. If you don't need the wider f/2.8 aperture, one of these models likely makes the most sense for you. The f/2.8 models can stop action in 1/2 as much light as the f/4 models and with the shallower DOF (Depth of Field) at f/2.8, they can create a stronger background blur. Without considering IS, the f/2.8 models can be handheld in 1/2 as much light as the f/4 models. Adding IS increases the cost of the lens, but it also results in a much more versatile lens that is also nicer to use because of the stabilized viewfinder image. Only the IS versions are weather sealed. Price is a big differentiator. 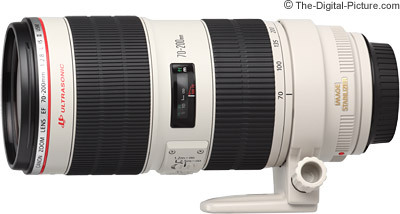 The Canon EF 70-200mm f/4.0L USM Lens is the most affordable lens of the group. If your budget stops here, you still get a lot of lens for the money. 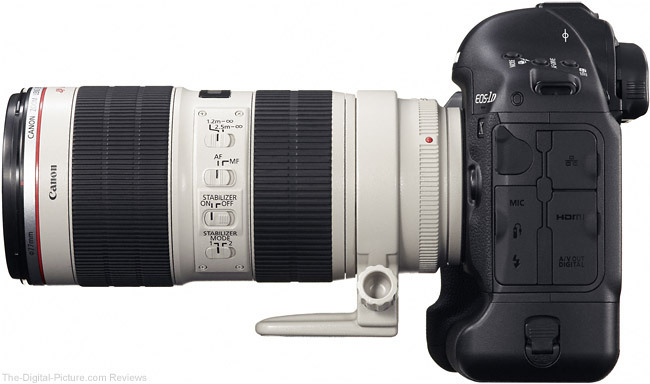 The Canon EF 70-200mm f/4.0L IS USM Lens has even better image quality and of course, IS. Relative to the Canon EF 70-200mm f/2.8L IS II USM Lens, the f/4 IS has more CA at the longer half of the focal length range and more vignetting at f/4. Otherwise, the both of these lenses have impressive image quality. I'm often asked if I really use f/2.8 much on my 70-200 L. Reality is that I use f/2.8 much more than all of the other apertures combined. This focal length range requires a very large shooting distance for group photos, so unless I'm shooting landscape or architecture, I typically have a single subject that I want to stand out in the photo - and possibly to stop the motion of. The shallow f/2.8 DOF combined with this telephoto zoom range can create a very nicely blurred background - making the subject pop. For stopping action, especially in low light, an f/2.8 aperture can make a big difference. If you are only shooting action, the Canon EF 70-200mm f/2.8L USM Lens probably makes the most sense for you. Although the f/2.8 IS II has somewhat better image quality at f/2.8, the premium cost for the IS version must be considered. If you want the best 70-200 L lens available - and arguably the best Canon zoom lens ever made (as of this review date) - the 70-200 f/2.8L IS II is definitely the lens to get. The uses for this lens could fill a book. Or maybe a series of them. The Canon EF 70-200mm f/2.8L IS II USM Lens is my first choice portrait lens. Some may find the 70-200mm focal length slightly long for portraits when using a APS-C/1.6x FOVCF body, but it works great for tight and moderately tight portraits even on these bodies. Full frame body owners will find the 70-200mm focal length range will allow full body portraits to tight head shots - and the improved MFD is especially noticeable when shooting full frame head shots. With IS, careful framing and low light shooting is easy. Event photography typically involves people in low light venues - and the 70-200 f/2.8L IS II is an ideal event lens. This is probably the second most important lens for weddings - typically very light-challenged events. Ever meet someone who couldn't smile for a camera? This focal length range is useful for capturing unsuspecting subjects - resulting in more-candid, natural shots. The relatively narrow FOV from this lens makes it easy to put an attractive background behind the subject - even in a cluttered environment. Other indoor events such as church and stage performance are great uses for the 70-200 f/2.8L IS II. With a wide f/2.8 aperture, fast AF and excellent wide open image quality, the Canon EF 70-200mm f/2.8L IS II USM Lens is a great sports lens. Watch the pro photographers on the sidelines of your favorite sports event - most have a 70-200 f/2.8 hanging over their shoulder even if they are using one of the big guns as their primary lens. The 70-200 IS II frames sports figures best on large fields (soccer, baseball ...) when used on an APS-C/1.6x body. An f/2.8 lens is marginal for stopping indoor sports action, but it will get the job done - especially if you have one of the latest DSLRs with great high ISO capabilities. Although the Canon EF 70-200mm f/4.0L IS USM Lens is a better landscape lens (because of its smaller size and lighter weight), the 70-200mm f/2.8 will deliver landscape images that are at least as good. For serious wildlife photography, I usually recommend a longer focal length lens such as the Canon 100-400mm f/4.5-5.6L IS USM Lens. But, the 70-200 f/2.8L IS II will work great if the subject is relatively close and/or large. When paired with the Canon Extender EF 1.4x II on a Canon APS-C/1.6x body, this lens works especially well for this purpose. As always, use the image quality tool to directly compare the 70-200 II IS with the rest of the Canon Zoom Lenses. I think you'll be impressed as much as I am. 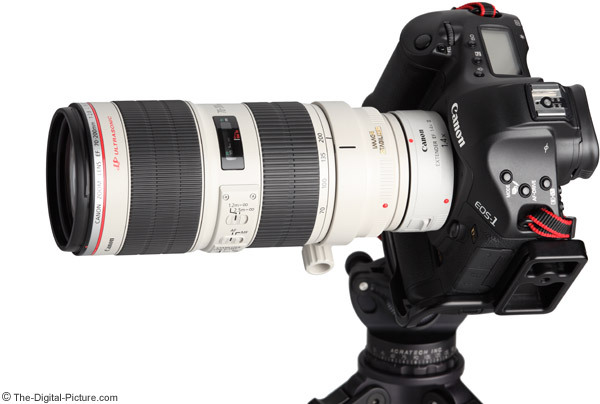 The 70-200 f/2.8L IS II is shown mounted on a Canon EOS-1D X DSLR above. For this review, I purchased three 70-200 f/2.8L IS II lenses retail (one has earned a solid position in my primary kit). Testing for this review was performed with the Canon EOS 5D Mark II, Canon EOS-1Ds Mark III and Canon EOS-1D Mark IV DSLRs, but this is a great lens for any Canon EOS DSLR. I consider the Canon EF 70-200mm f/2.8L IS II USM Lens to be the second most important lens in my kit with the first being a more general purpose lens in focal length range. It is not an inexpensive lens, but it is very worth the price in my opinion - and very worthy of its red ring. While this is a completely pro-grade lens, you definitely do not have to be a pro to appreciate it. Get the "II"!